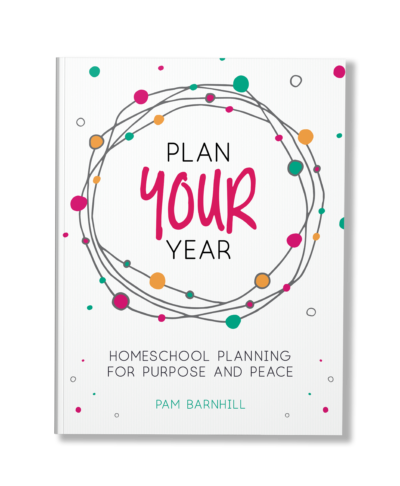 Get your free Plan Your Year homeschool planning pages here. I wish I could tell you that I have the formula for the perfect homeschool day, but sadly I do not. 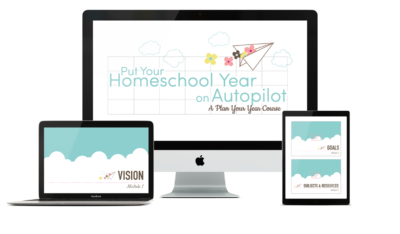 All I know for sure is that there are no two homeschool days that are exactly alike and whatever you plan, it will often not go exactly as planned. Yes, having a plan in place is important. If we don’t, the overwhelming nature of the task before us will paralyze us. 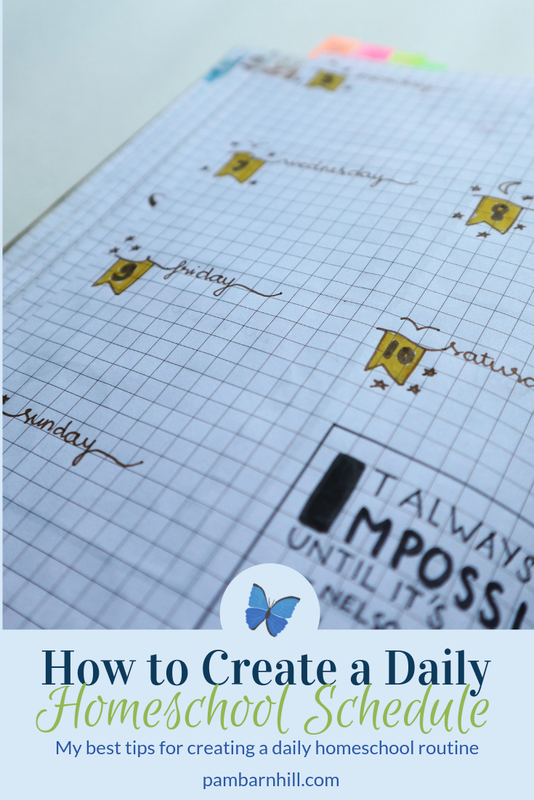 So here are my 8 best tips for creating a daily plan that inspires you to get things done. So very few of us are going to practically be able to follow a schedule. For most, time slots on a chart are only going to frustrate us as life happens and we are constantly thrown off that schedule. So instead of a hard and fast block that says you will start math at 8:00 and then do reading at 8:45 and spelling at 9:10, shoot for beginning your first work block sometime between 8 and 8:30 and then have one thing follow another until you are done. I like to call specific chunks of time “blocks.” It is easier for me to schedule in the blocks of our day instead of individual subjects. You can see from the sample schedules in my last post, that our day has four big chunks in it. I do not micro schedule within the blocks. While I complete the blocks in the same order every day, the order within a block often varies based on what I am doing for that subject on a given day. For example, if both spelling and Latin require a large amount of writing for that day, then I will put the reading lesson between them to break them up. If I am using letter tiles in both reading and spelling, then I typically don’t do them back-to-back — just to separate the repetition. The next day, the order might be different. So while my blocks have a certain order — the subjects within the blocks do not. I always try to alternate more taxing tasks with lighter ones to give our brains a break. You are never going to squeeze five hours of schoolwork into a five hour block. Something is going to happen — the washing machine will flood, the dog will escape over the fence, someone will decide this is a great day to have a stage-four math meltdown. You will most likely not get it done, and you will end up frustrated. Schedule 3.5 hours of school work into a five hour block. Trust me and you will thank me later. What can you do while nursing? If baby wants to eat every morning at 8:00, then that is a great time to read aloud to the other kids. Since we know reading aloud is important up until your older children leave the home, gather everyone together and enjoy this time. Little ones can play quietly at your feet and everyone can find something to do with their hands. If you can’t read and nurse at the same time due to a wiggly older baby then pop in an audiobook or allow an older sibling to read. In fact, nursing time is also a great time for mom to be read to, so schedule time for reading aloud for emerging readers during nursing time as well. Older children armed with memory work binders could also lead family recitation time during this period as well. You can also make toddler care and entertainment part of the bigger kids’ school time. While you work with one, the other’s required task can be to play with little brother or sister and see to their needs for an allotted amount of time. Put preschoolers first. Often a little one-on-one attention from mom goes a long way towards the little one going off to play alone happily for a while. 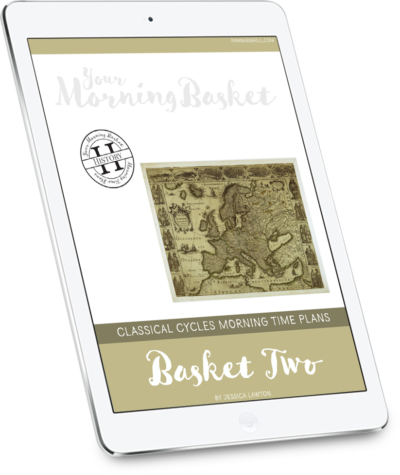 Schedule in story time and a fun activity for your twos, threes, and fours before you get started with the bigger kids. Utilize the nap time. School does not have to start early in the morning. If you have two or three young kids and one or more of them still take a long afternoon nap, then don’t start school until the little ones go down. School can go from 1-3 and can be done peacefully and with less frustration. Schedule the messiest, hardest, or most mom-consuming subjects for nap time. I taught language arts for a while during my teaching career. Language arts is the catch-all name for about five different subjects — spelling, writing, grammar, literature/reading instruction, and handwriting. I did not try to do all of these subjects every single class period. In fact, I didn’t even try to do all of them in a given week. So feel free to alternate days or choose an alternative scheduling method like blocks or looping to fit in all of your subjects. Everything needs to be done regularly — not daily. Want to be sure something gets done each day? Then hang it on one of the natural hooks of your day. A natural hook is a meal (we all eat) or naptime or a nursing session. Use these set times of things you know you will be doing as hooks for important parts of your schedule — prayer, reading aloud, memory work, art. Move right from your hook into your subject and soon it will become a habit. If your family does not jump out of bed running in the morning, then resist scheduling an early start to your day. Enjoy the flexibility of homeschooling and work at your times of peak productivity. This also means taking into consideration your children’s natural schedule and the fact that they have variations (which may not match yours!) as well. Got one early riser? Schedule his or her independent work first. Let the others get up right before group time and then do their independent work after. Homeschooling is beautiful because we don’t all have to move lockstep towards the finish line. Embrace it! 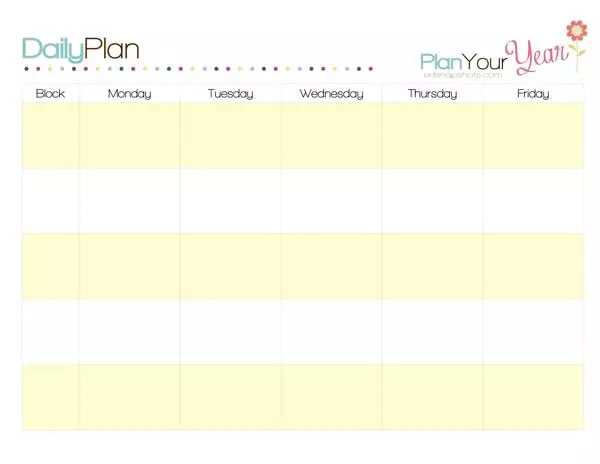 Use the Daily Plan form from the free Plan Your Year Homeschool Planner to draft out your days. I strongly suggest sitting down with this form and a pencil for the first draft. Mine always has a lot of erasing as I figure things out. Once you have your blocks in place, start filling them with subjects. Think about what naturally goes together for your family. My kids do math and handwriting while I finish up my morning chores. Then we move to morning time and then break again for table work (all other written subjects). On a final note, sometimes it helps to live with your plan a while before finalizing it. Get it good enough, live with it a week or two when you begin, and then finally make adjustments as needed. Shaking my head in agreement on a routine instead of schedule. 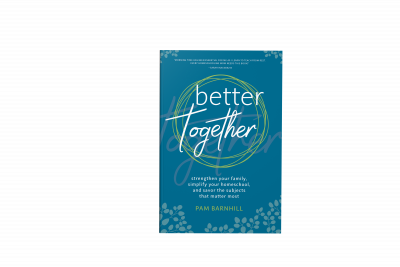 I’ve learned that things change quickly in a growing family or with growing kids. What worked last year or even last month may not work any more and you have to set down and rework that routine. Too bad the “this routine doesn’t work anymore monster” doesn’t come up and hit you on the head to let you know, lol! It seems like we start having bad days that will turn into some bad weeks which leads to a bad month. Then we step back and ask what happened and we realize it’s time for a routine change. I then wonder why I didn’t see that a few weeks ago! Great post! The younger they are, the faster it changes for sure! 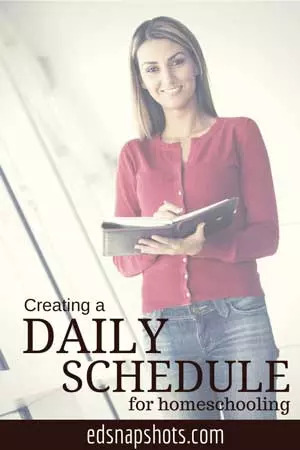 Another brilliant post about scheduling. It’s taken me all these years to begin to see the wisdom in this, and you spelling it all out is so valuable. I’ll be referencing this as I look ahead to next year! Excellent advice. We have to work off of routine here. I love schedules, but my kids can’t do it – biologically CAN’T. So I have my schedule and we treat it as a routine instead. Love the way you do what works for your family Michelle! Make it work. Marvelous advice–I’m pinning and sharing with my FB crowd! I couldn’t agree more. 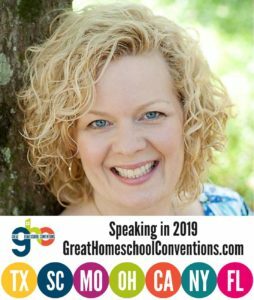 My first year homeschooling every moment was scheduled. It left no room for struggles or for additional learning when a subject was more fun. By switching to a routine we are able to spend as much time as we need on each subject while still getting things done. Thank you for all this wonderful advise, laid out in practical yet concise steps. When things get chaotic, it is helpful to me to have a list of things that I can do while nursing. Sometimes in the heat of crying baby, destructive toddler, and bickering older siblings, My mind goes blank about all the things I CAN do while nursing. Also, my favorite strategy with tots and preschoolers is BUSY BAGS. What a lifesaver they have been! Couldn’t understand the website address to find The Confident Homeschooler audio book. Could you help me with that?